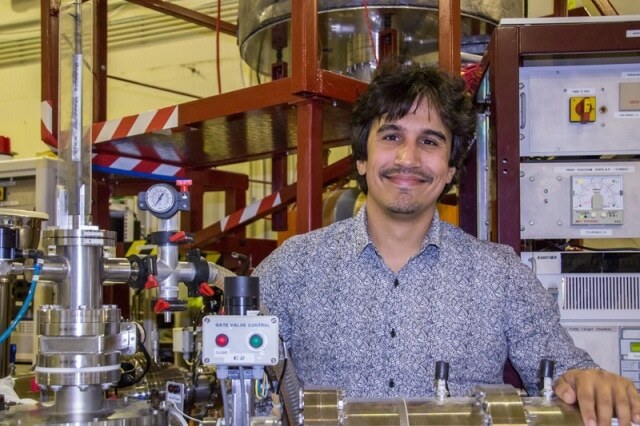 The KiwiNet Emerging Innovator Fund has awarded $20,000 to Dr Jérôme Leveneur, a researcher in the Environment and Materials division of GNS Science¹s National Isotope Centre, to create an innovative nano-scale magnetic material. The magnetic material composed of nanostructures created by Dr Leveneur is 1000 times thinner than a human hair. The material’s improved properties over the traditional magnetic materials can be attributed to its small scale. This latest development could be exploited to enhance the energy efficiency of inductors and transformers. Dr Leveneur expects that many industries would benefit from this novel, high-performance material which would promote a radical development in electro-magnet technologies that are used in radio communication, inductive power transfer, and electric motors areas. When you switch regular electromagnets off they hold a fraction of their magnetism and it costs additional energy to switch them on in another direction. With nanomaterials the magnetism can be switched on and off at no additional energy cost, increasing efficiency. KiwiNet launched the Emerging Innovator Fund along with philanthropic support from the Norman F. B. Barry Foundation to assist initial career scientists in taking their ground-breaking science to the market. This fund is accessible to researchers from universities and Crown Research Institutes who exhibit a unique concept and are willing to partner with the industries as they create a prototype. Jérôme’s research is potentially a game changer in the field of magnetic materials. It focusses on new types of solid nanostructured magnetic materials that can be moulded into any size or shape and previously only very particular shapes and sizes could be made. Leveneur would utilize the Emerging Innovator funding to work with inductors and transformer manufacturers in New Zealand who would eventually benefit from the latest research. His aim is to prove how his novel material is better than the present materials or examine novel designs which cannot be achieved through traditional methods at present. Dr Bram Smith, General Manager of KiwiNet is thrilled about the immense opportunities the Emerging Innovator Fund offers to initial career researchers. The fund aims to spur on some of New Zealand’s most talented early career scientists. It's a collaborative effort with the Norman F. B. Barry Foundation providing the funding, Minter Ellison Rudd Watts providing in-kind expert legal support, Baldwins offering IP advice and KiwiNet recruiting a commercial mentor to support Jérôme. KiwiNet is growing this initiative over the next year to give our next generation of innovators a real boost in their ground breaking work. John Smith, Chairman of the Norman F B Barry Foundation, visualizes the Emerging Innovator Fund as a perfect way to exploit connections and combined resources. Both KiwiNet and the Foundation share the common goal to inspire young people to pursue science careers and seek out opportunities to apply their knowledge to benefit the community and the economy.